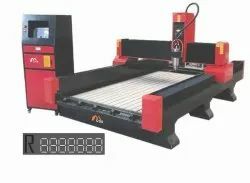 Leading Manufacturer of cnc wood cutting machine and stone cnc router from Delhi. 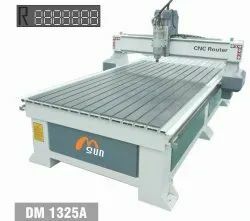 By keeping track with the technological development, we are offering optimum quality CNC Router. (1) Y axis with double motor drives ensured stable and smooth movement. (2) High precision rack gear transition ensures fast speed and high accuracy. (3) Welded structure by thick profiled steel, ensures minimum distortion, excellent rigidity, and powerful strength. (4) Adopted spare parts of high quality to slow the fault rate. (5) Equipped with powerful spindle motor to make sure a powerful cutting and steady movement. (6) Electrical protection device provided, the machine can save the original cutting or engraving work after an outage. Widely used in 3D carved plates with wave patterns. cabinet door, craft wooden door, non-painting wooden door, screen, craft windows, computer desk and panel furniture auxiliary processing, etc. Can cut and engrave brass, aluminum, iron, plastic board, PVC pipes, acrylic, etc. 3D engraving, line engraving, cutting, drilling and two-dimensional carving on natural marble, granite, artificial stone, tombstone, milestone, ceramic tile, glass, wood and so on, do 3D engraving, line engraving, cutting, drilling.